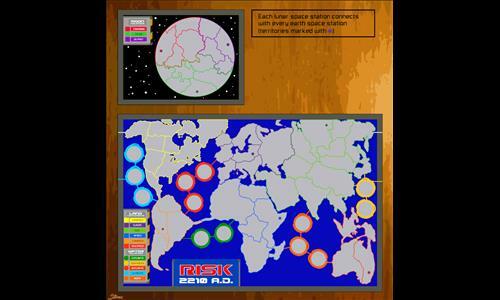 Map inspired by the board game Risk 2210 AD. Review by Brotherdan on 6/28/2018. Nice variation of a world map, with the addition of moon and relative space stations. Visually very appealing, with the wood-like contour. Sufficiently small for fast, few players FFA games. EDIT: issues solved, and many enjoyable distribituion modes! Thanks for this very nice map! Thank you for the helpful review Brotherdan! Review by adamg5 on 4/22/2019. Nice Remake of a game that usually doesn't have endless turns.